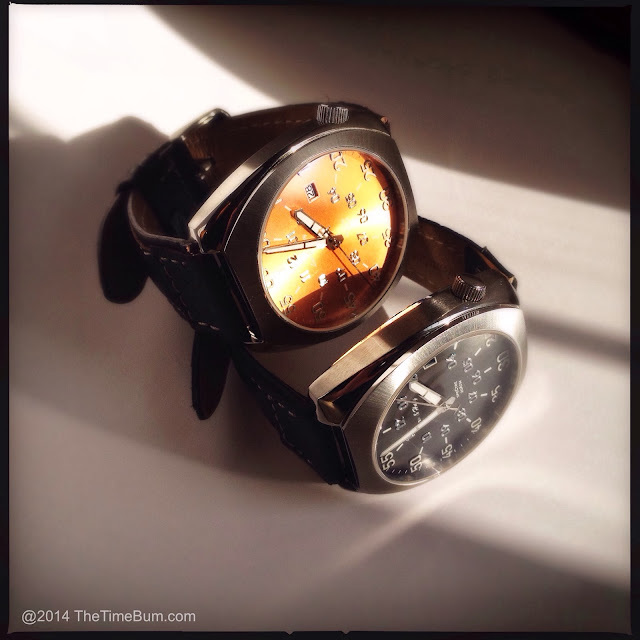 Chris Vail of Lew & Huey does not make boring watches. Each successive model has explored a new and unexpected direction. The Time Bum has reviewed each. His first, the Riccardo, was a large mechanical chronograph, inspired by late 1960s race timers. His next model, the Acionna, incorporated aviation elements into a stout compressor style case. With his third effort, the Spectre, he continues to push the envelope by placing a blinged Beobachtungsuhr dial in a barrel case to create a military aircraft sport... disco... um... It really has no easy category. Just look at the picture and read on. The Spectre draws its name from the Lockheed AC-130H, a massive, heavily armored gunship that Chris describes as "a flying fortress filled with hot death." 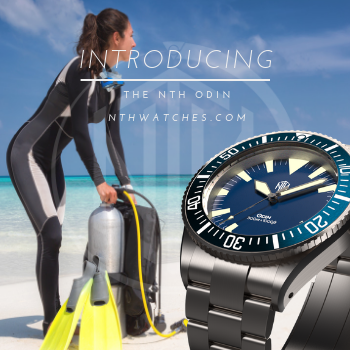 With a name like that the watch had better be a rugged beast, and with 200m water resistance, screw down crown, domed sapphire crystal, and a rock solid Seiko automatic movement, it does not disappoint. 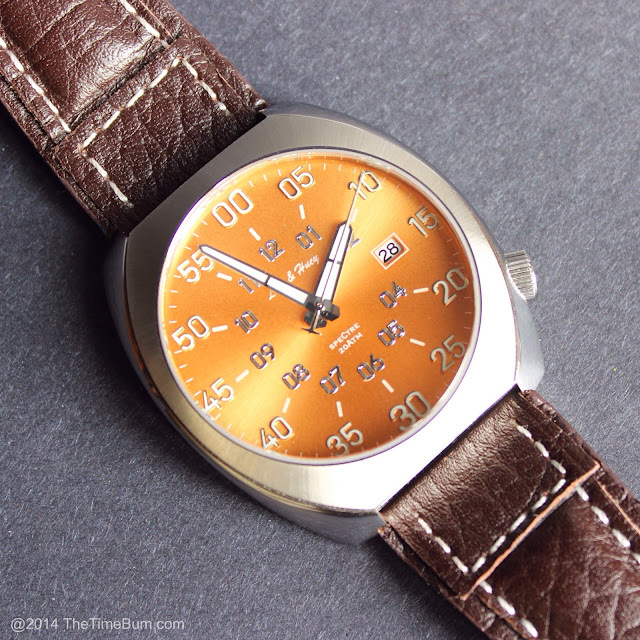 The military aircraft theme is most apparent in the oversized, B-uhr inspired dial. Just like a classic navigator's watch, the Spectre's outer ring marks 60 minutes/seconds with Arabic numerals in increments of five, and an inner ring marks 12 hours. That is also where the military style ends, and for good reason. 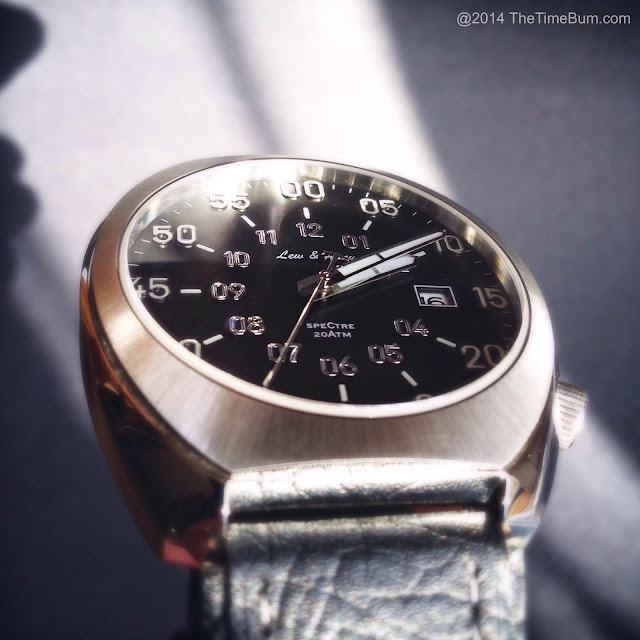 There are plenty of navigator style pilot watches out there, but only one like this. For starters, the numerals on your typical B-uhr are painted. The numerals on the Spectre are applied and polished, giving the face a satisfying dimension. 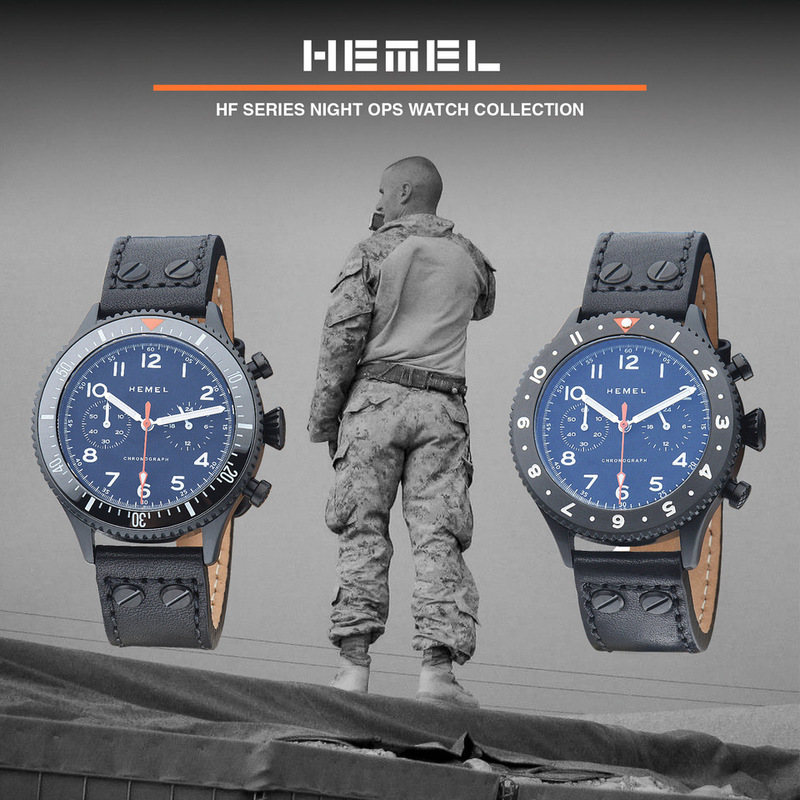 Most military watches have a matte finish dial. The Spectre's dial is available in Midnight Black or Fireball Orange, with the sun ray effect that has become a Lew & Huey hallmark. All three hands are polished and the thick baton hour and minute hands are filled with lume. The second hand is decorated with a T shaped tail. The dial features a date window at 3:00. The only text is the Lew & Huey script in the upper half, and "Spectre 20ATM" in the lower half. "Sparky," the Lew and Huey dog, has been banished to the etched case back. 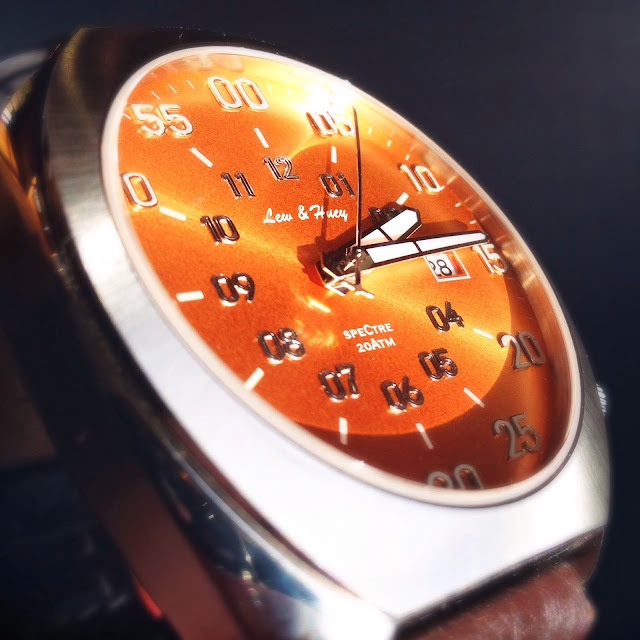 It is a busy dial, but the effect is striking: slick and sinister in black, pure madness in orange. Prototypes must be analyzed in a different manner than finished products, as certain elements are subject to revision. The markers are an example of this. On this unit, the larger, outer markers are filled with lume, while the smaller, inner markers are not, although they have been made with shallow pans for this purpose. Chris explains that the inner ones proved too small to be effectively painted with luminous material. The result is a bit disconcerting, as the hour markers appear far brighter than the outer markers, which makes them seem out of place and harder to read. Chris is exploring several different options to address this issue and improve readability in the final version. 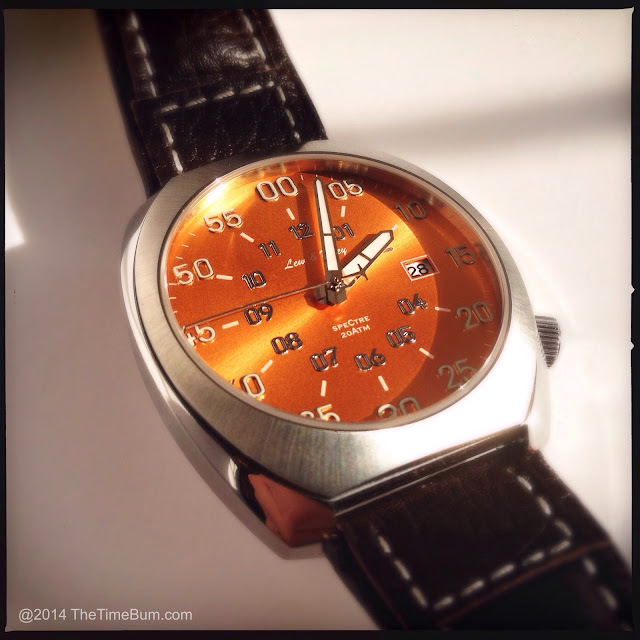 Another element subject to change is the color of the Fireball Orange dial. In certain light, the prototype appears to be a copper color. The production Fireball promises to have more of a red-orange fire to it. 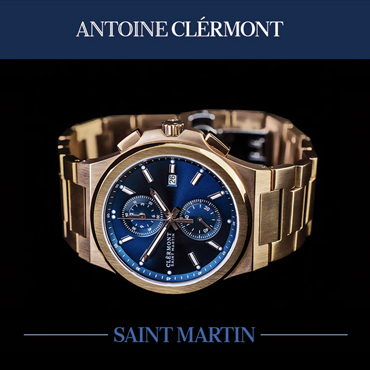 The stainless steel case is 44mm wide and 15mm thick, which givies it a commanding presence. This large barrel is brushed on the sides, polished on the upper surface nearest the lugs, and brushed on the uppermost surface in a radial pattern that echoes and extends the sun burst of the dial. 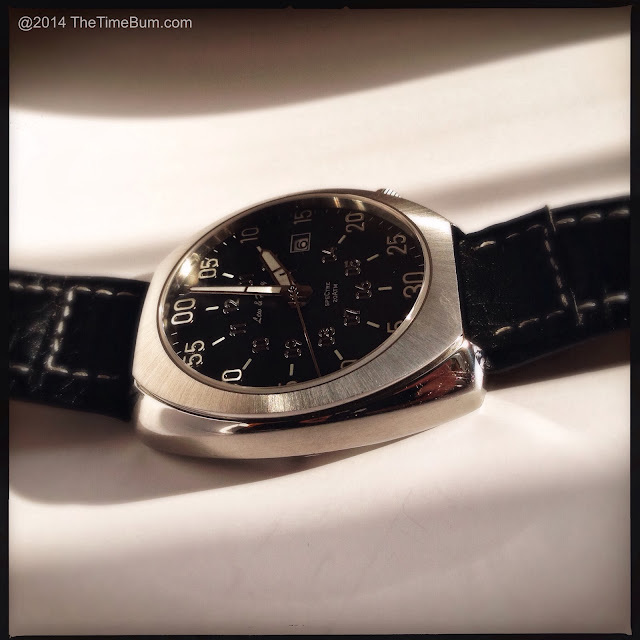 The basic shape of the case is somewhat reminiscent of the Seiko 6119 series, but more angular, and with more heft. 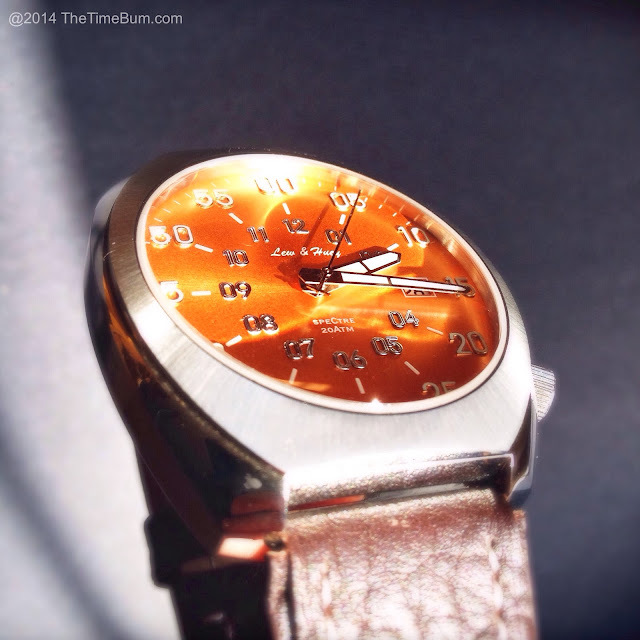 I have found that many watch designs rely on old familiar cases and confine their creativity to the dial. It is refreshing to see someone take a risk on a case too. It may be a nod to the 1970s, but it is executed in a very modern manner. Each Lew & Huey model has used a different movement; first, the Sea-Gull ST19 in the Riccardo, then the Miyota 9015 for the Acionna. The Spectre contains a Seiko calibre 4r36 (NH35) the next evolution to the wildly popular and reliable 7s26. The 24 jewel, 21.6k BPH automatic hacks and hand winds with a 40 hour power reserve. The Seiko movement helps keep the Spectre's price competitive, and like the venerable 7s26, it should provide years of trouble free service. A coin edged crown is in the 4:00 position and although it is unadorned on the prototype, production crowns will feature an engraved "Sparky." Strangely, the Spectre wears its date wheel at 3:00, instead of 4:00 as is usually the case with this movement (Seiko's NH36 has the 3:00 crown and date). Relocating the date required printing new disks to get the alignment right. While I applaud the effort, I question its necessity. I don't feel the date detracts from the watch face, but with so much of the dial occupied, I don't believe it was necessary either. The watch wears a 26mm strap, notched to 22mm at the lugs, and tapering to a 20mm buckle. It is available in black or brown with white stitching. The center section is padded. The design is sporty but distinctly aircraft inspired. It is also beefy enough to balance the watch's considerable visual bulk. Production models will have an improved strap with thicker padding. I was concerned that the Spectre might be too much for my own rather modest 6.5" wrist, but with its short lugs, overall height is only 48mm, placing well within my limits. 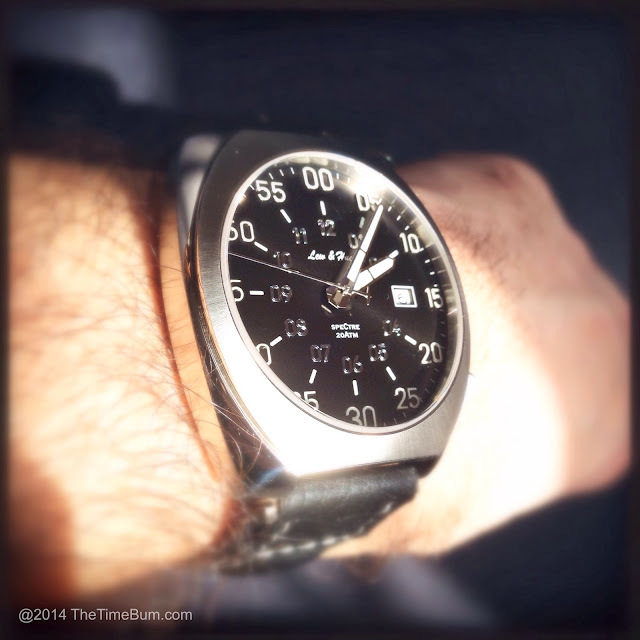 Even so, this is not a watch that will slip easily under a cuff, or pass by unnoticed. It is a bruiser, and it demands to be seen. Classifying the Spectre is an interesting conundrum. The dial layout is military, but the distinctive case, polished markers, and dazzling dial inspire a different kind of admiration. In the end, I thought it less likely to be found in the cockpit of a Spectre gunship, and more likely to be in the dormant volcano HQ of SPECTRE (SPecial Executive for Counter-intelligence, Terrorism, Revenge and Extortion). Ernst Blofeld, your watch is ready, or at least it will be once the Acionna Kickstarter hits 200 per cent of goal. [Update 2/12/14: The Spectre campaign has just launched on Kickstarter] Pre-order price is $300. 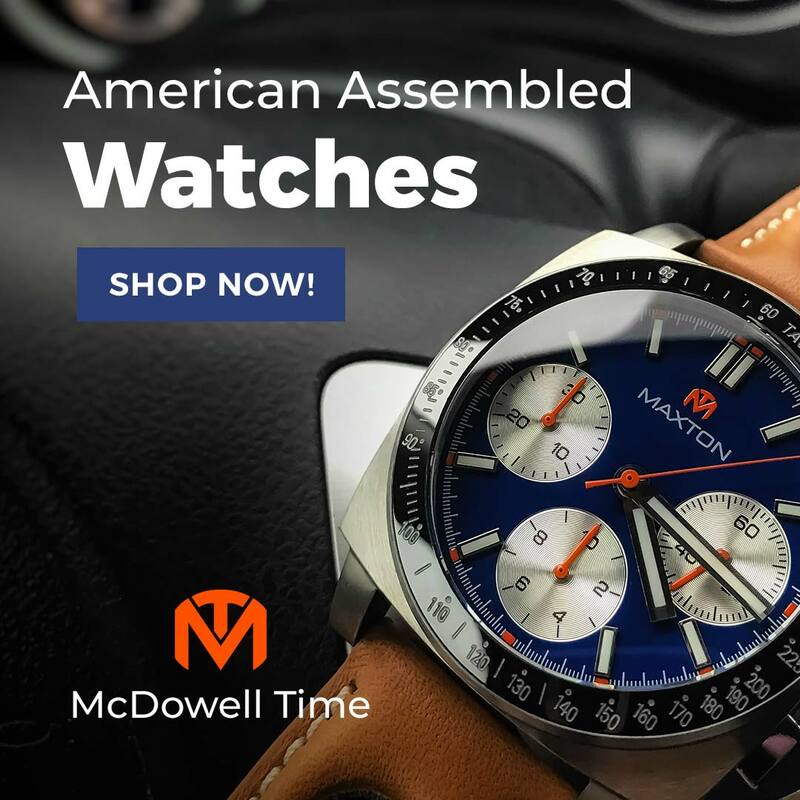 There is no shortage of excellent $300 watches out there, but not one of them looks like the Spectre. Chris has chosen an unconventional path through the world of watch design, and it is lucky for us that he has.